Place chickpeas, garlic, onion, parsley, coriander, cumin, flour and egg into a food processor and process until almost smooth. Using your hands, divide the mixture into 8 and roll 8 falafel patties. Cover and refrigerate for 30-45 minutes. Meanwhile, prepare parsley salad. Combine parsley, tomatoes, red onion, cucumber, and lemon juice in a medium bowl and stir to combine. Set aside. To make tahini yoghurt, whisk together yoghurt, garlic, tahini, lemon juice, ground cumin, pepper and olive oil in a small bowl until well combined. Heat oil in a large frying pan over medium heat. Cook patties for 4-5 minutes each side or until cooked through. 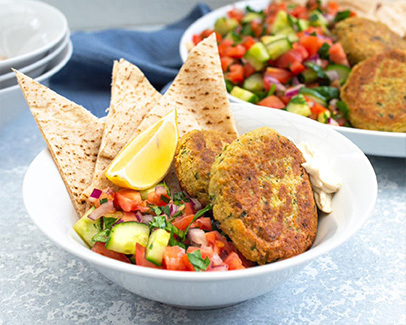 To serve, divide the parsley salad, falafels and pitas between the 4 bowls. Top with tahini yoghurt and a lemon wedge.